In the 1980s there were, at most, twelve basic colors for tattoo artists to combine and dilute. Black was the dominant pigment with colors added sparingly. The history of Eternal Ink begins in 1976 with Terry Welker. Terry is a self-taught tattoo artist in the traditional style. He tattooed for several years before opening his first studio, Eternal Tattoos. This first studio grew into a chain of five tattoo studios in Detroit, Mich.
As an artist, Terry experienced first-hand the limitations of traditional ink, the challenge of color mixing and matching as well as questionable product quality. He recognized the need for an ever-expanding, multi-colored, quality tattoo ink system. First, he began hand-mixing a line of consistent ink colors for the tattoo artists in his studio. In 1998, he created his own palette of colors. During the next few years, Terry Welker’s tattoo ink grew in popularity. Tattoo artists and his industry friends requested more ink and more colors. The tattoo ink recipe improved, evolved and expanded into a wide rage of ink colors. Ultimately mixing ink grew into a successful business and took on a separate existence from the tattoo studios. In 2004, Eternal Ink, Inc. was formed to manufacturer tattoo ink for tattoo artists. 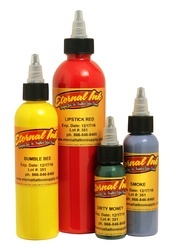 Eternal Ink rapidly became the premier manufacturer and supplier of tattoo inks in North America. Terry Welker’s original palette of colors has expanded to more than 200 Eternal Ink colors distributed worldwide. Eternal Ink is named after Eternal Tattoos: the five tattoo studios that prompted the creation of a new approach to tattoo ink.